It all started with a pocket on a tee shirt. An idea to put a functional "holster" positioned pocket on a "tee" shirt is born and the HOLS - TEE adventure begins. Q- I am one of the millions of people who have been inspired by your manifesto and I love the story of the collaboration that went into its creation. What can you tell us about the vision behind the manifesto that we would be surprised to know? The vision behind the Manifesto was a why for Dave, Fabian and I, a reason for ourselves, for why exactly we were ready to pass on 'good stable opportunities' to start a super risky business during a major recession. Q- In a world where working hard and climbing the corporate ladder is the norm, why is encouraging people to live mindfully so important to you (Holstee)? A year after the founders write down what was on the top of their minds and the tips of their tongues, the words of the Holstee Manifesto are brought to life by illustrator Rachael Beresh. This honest collection of values and ideas turns out to be one of the most shared posters of the year. The online image spreads rapidly, uniting others around the world who share this passion to live life fully and freely. Holstee came into existence to help us remember what's important. We wrote the manifesto to re-define what it means to be successful. Society has a whole suffers when everyone is solely focused on something like 'corporate ladder climbing' at the expense of everything else. This all stems from the way each of us choose to live as individuals and the decision we make on a daily basis. To be clear, ambition and living mindfully are not mutually exclusive. In fact these traits are often complementary, but requires a different type of thinking, I would define as non-autopilot or awake. Q- What inspires you these days? What has allowed you to keep going and keep showing up and bring new ideas into the world? Creating a positive impact through design has been my greatest inspiration since day one. As we continue to add more experiential activities into the mix, it is increasingly the response and ability to become a community center. Our super ambitious goal is to become the iconic brand of the 21st century - one that truly balances social impact with business. Q- People just learning your story, might be shocked to learn that you left your stable jobs in them midst of the country's worst recession to "live your passion" and stuck it through almost 6 years later. What piece of advice can you give those of us who might be afraid to take that leap of faith to go for our dreams? Is it worth it? It has not gotten any easier from day one. What I do at Holstee: Mad scientist responsible for letting the world know about Holstee. In the summer of 2009, brothers, Dave and Mike Radparvar decided to quit their jobs in the heat of the recession to fully focus on Holstee, a t-shirt side project they had started with their friend, and co-founder, Fabian Pfortmüller. Without a business plan, or experience in fashion and retail, they reasoned that in the worst-case scenario, it would be the most memorable summer of their lives. They joked that they could always return to the 9-5 work world if the dream to start a company failed. Holstee began with the intention of creating a t-shirt with a more functional design by adding a holster-positioned side pocket to carry a phone or notebook-- hence the name, hols-tee. In producing the t-shirt, it became clear that the shirt’s design was as important as how it was made and what it was made from. Not long after, they went into production on a 100% recycled fabric shirt, cut and sewn in North Carolina, less than 100 miles from where the fabric was made. This set the precedent for how Holstee would design and manufacture moving forward. Where we began and what keeps us moving forward today. Originally written to celebrate aspects of life they truly valued, Holstee's founders never imagined how far and wide this message would reach. More than anything, Dave, Mike, and Fabian were looking to build a company that would allow them to live their dream. They wanted to make that happen by creating a company that aligned with their personal values, the hope of leaving a lasting positive impact on the world. They continue to follow through on this mission today by inspiring others to do the same. One of the first things the trio did when they started Holstee was sit down on the steps of Union Square in New York City and write down why they were starting Holstee, what they wanted from this new company and moreover, what they wanted from life. This message to their future selves became known as The Holstee Manifesto. Originally placed quietly on their website’s ‘About’ page, the message took the world by storm with an estimated 100 million views. The Manifesto has been translated into 13 languages (and counting! ), and was called “The New Just Do It” by the Washington Post. The words of the Manifesto continue to guide the company, as it continues to grow beyond its products and into a company that aligns itself with the values of the Holstee Manifesto. Today, Holstee offers a range of products the are designed to bring inspiration into peoples’ lives. From its iconic poster designs to the hand-crafted Reclaim Frames, all of Holstee’s designs are meant to inspire people to reflect and act on what matters most in life. Holstee’s most popular products today include the Mindful Art Subscription, Reclaim Frames, and inspiring letterpress posters. With the launch of their new Work/Shop in Gowanus, Brooklyn, Holstee is bringing its community together in real life though monthly Potluck Dinners, Yoga and classes. As Holstee continues to grow, the values set forth in their Manifesto continue to remain a thread in each new endeavor. 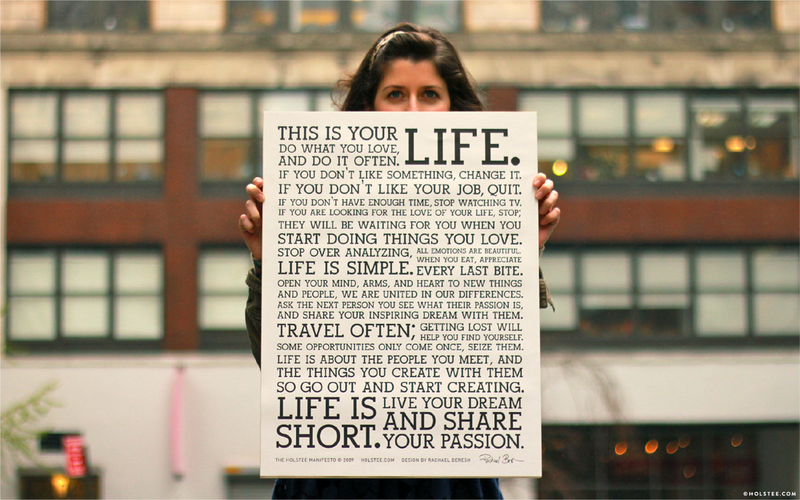 The Holstee Manifesto: The story of a poster that defined a generation. Brooklyn, NY - In our first step as a company, Holstee’s founders, Dave, Mike and Fabian, sat together on the steps of Union Square in New York to write down how they defined success. The goal was to create something they could reflect back on if they ever felt stuck or found themselves living according to someone else’s definition of happiness. They sat down with a composition notebook and a pen and started to write, “This is your life.” The rest of the Manifesto flowed naturally and was completed that day, save for the addition of a semicolon and some other small grammatical corrections. From there, it was added to Holstee’s ‘About’ page, more as a personal reminder than anything else (there wasn’t much traffic in those days). Nevertheless, people who visited Holstee’s website kept asking if the Manifesto was available as a poster. In 2009, the words of the Holstee Manifesto took form in a bold letterpress poster with the help of typographical designer, Rachael Beresh. Not long after it began to take the internet by storm, with the Washington Post calling it “The Next Just Do It”. United in our differences. It could be no coincidence that we received both the Hebrew and Arabic translations of the Holstee Manifesto at nearly the same time. We paired these languages with the Hamsa, a symbol that is recognized as protection, blessings and strength across the entire Middle East. The calligraphic design, created by Josh Berer, brings the blue Hebrew text and green Arabic texts together to fill the iconic symbol. The Manifesto has been translated into 13 languages (and counting!) with the help of our worldwide community, including French, Spanish, Japanese, Korean, Polish, and Hebrew and Arabic. In 2012, we launched MyLife to collect the many stories people were sending in about how they chase their dreams, live their best lives and how they have chosen to redefine success in their own terms. Years later, it is monumentally encouraging and inspiring to see how many people with which the words of The Holstee Manifesto have resonated. We are honored, proud and humbled to have such a remarkable community that surrounds and supports Holstee. Today, the Holstee Manifesto is available as a prints, poster, framed poster, tote bag, journal, cards and wall decal. Our vision is to grow Holstee into a collection of startups. From a cafe to building bicycles - any product or service Holstee offers will always be inspired by our community and intended to encourage mindful living. Read more about our vision, and how we want to positively influence 1 billion people.